[German]Malwarebytes users recognized sporadic freezes in Windows 7 with Malwarebytes version 3.6.1.x. Malwarebytes has now released an update to fix this sporadic freezing. [German]Microsoft has released the KB4464455 (v2) update for Windows Insider. This update applies to the withdrawn Windows 10 V1809. The update is intended to fix out additional bugs, such as the ZIP bug. [German]Another information for administrators running a System Center Configuration Manager (SCCM). In SCCM version 1806 there is the problem that updates are not pulled if the WSUS has no connection. Microsoft has released a hotfix for this. [German]Microsoft has kept its word and delivered the fix for the broken SMBv1 protocol in Windows 10 April Update (V1803) with update KB4284848 in June 2018. 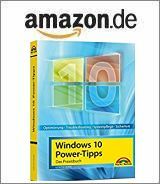 [German]Microsoft released a new cumulative update KB4100403 for Windows 10 version 1803 (April update) as of May 23, 2018. The update is also intended to fix problems when using SSDs in conjunction with the NVMe interface. How to empty Kyocera FS-1030D waste toner box? [German]Users of a Lumia with Windows 10 Mobile who are still using version 1703 can be happy. Microsoft has released an update that fixes the PDF display error in the Microsoft Edge browser.